I love the exchange at the end of Shakespeare's Henry V between the English king and Katherine de Valois, the French princess he is about to wed. To be truthful, it is the movie I remember, in which the charming Emma Thomson, who plays the French princess, is enthralled with King Henry, played by her then-husband, Kenneth Branagh. Watching the pair exchange witty remarks and a kiss, I assumed King Henry became the love of Katherine's life. At the time of their marriage, King Henry's army was rolling across Normandy and France with great success. 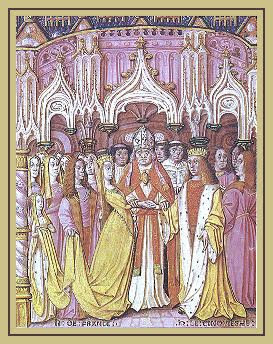 He claimed the throne of France and engineered the marriage as a more peaceful way to achieve his ends. By all accounts, however, the king was quite taken with his lovely princess. 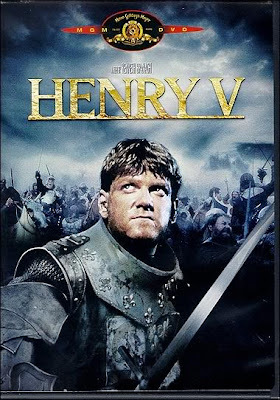 King Henry devoted himself 24/7 to ruling one kingdom and conquering another. Perhaps that made him a less-than-attentive husband. In any case, he died only two years after their marriage, when Katherine was not yet twenty-one. Doubtless the princess--now queen--held her husband in great esteem and affection. But the man who won Katherine body and soul, the man for whom she risked everything, was...her Clerk of the Wardrobe. 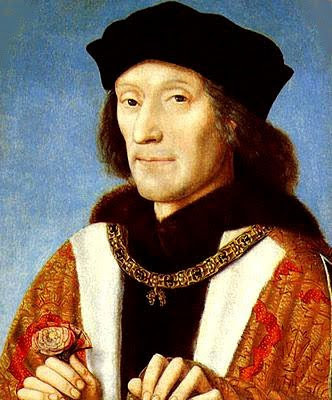 Owen Tudor was the son of a Welsh rebel. He had served as one of King Henry's "squires of the body," before joining the widowed queen's household. The story is that Owen came to the queen's "attention" when she spied him bathing naked. Thus began the mad love affair between the widow of the revered King Henry and her Clerk of the Wardrobe. I say mad, because the two risked a charge of treason. The men ruling England in the name of Katherine's son expected the queen to be content to sleep with her memories of the great Henry. They realized their error when she reportedly had a flirtation with one of the Beauforts. (Remember the Beauforts? And the Lancasters?) Katherine's brother-in-law, the Duke of Gloucester, was so concerned that a step-father could wield too much influence--which is to say, more influence than Gloucester--over the young king that he persuaded Parliament to prohibit Katherine from marrying without permission. And permission would not be granted. Despite the risks, the queen and Owen began their affair, most likely at Windsor Castle. Being together was a dangerous decision. The queen was a foreigner with few friends. 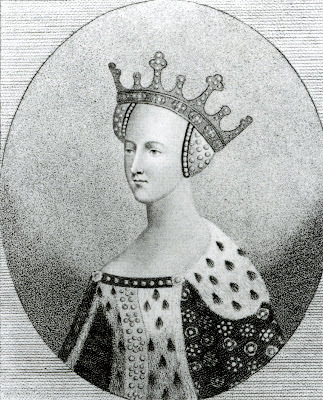 Many suspected her of secretly supporting her brother's claim to the French crown over her son's. I wish I could find a picture of Owen, because he must have been a handsome devil. Likely he wasn't wealthy enough to have a portrait painted before he became the queen's lover. Afterward, the couple did their best to keep a low profile. It is generally believed that the couple married in secret, and they did have four or five children. They lived in the country, away from the limelight, for several years with their growing family. It's not clear whether the men in power did not know the two were living as man and wife or whether they simply chose to ignore it. Queen Katherine and Owen Tudor's love story is a bittersweet one. Their quiet life came to an end in 1436 when Owen was imprisoned on a charge of treason, probably at the instigation of Gloucester. Upon Owen's arrest, the queen "retired" to Bermodsey Abbey, where she died after giving birth to their fourth or fifth child. After her death, the fifteen-year-old king ordered Owen released and elevated his half-brothers, Edmund and Jasper Tudor, to earls. Not bad, for the grandsons of a Welsh rebel. 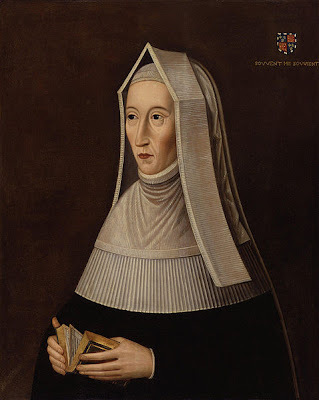 When Edmund Tudor was twenty-four, the king facilitated his marriage to Margaret Beaufort (yes, another Beaufort), a wealthy heiress. Margaret was twelve at the time. Edmund died before Margaret gave birth, at age thirteen, to their son Henry. It was this child, Owen and Katherine's grandson, who would later usurp the throne and begin the Tudor dynasty. Katherine de Valois and Owen Tudor are secondary characters in my third novel, KNIGHT OF PASSION (June 2010). ** Photos courtesy Wikipedia Commons or Photobucket.